Associates can now link Associates IDs and view consolidated global reporting across all linked stores from their home portal with OneLink. Amazon has launched a new feature for Associates to view consolidated OneLink global reporting, along with the ability to drill into country specific details from their preferred portal – significantly reducing the effort required to manage their international affiliates businesses. Until now, associates who have mapped their Associates IDs together needed to log into each individual portal every day to view their reporting, before manually converting them into a preferred display currency offline to stay on top of their global performance. With the launch of consolidated global reporting, Associates can now use the Global Reports summary view to look at a detailed picture of their total earnings across all linked stores in one place. 1. Why Should This Excite Me? Amazon has made it easier for you to view reports across countries where you have linked Associates IDs together for OneLink. Until now, you had to log into each country’s portal and look at reports individually. You can now log into your home portal and view a summary of your global OneLink performance in your preferred display currency. 2. How Do I Link Associates IDs? If you’re an existing OneLink customer, you don’t need to do anything. If you want to sign up for OneLink and link your Associates IDs, click here. 3. What Do Global Reports Look Like? The page has two parts: a summary view of your global earnings, which is a total of earnings across all stores that you have mapped for OneLink, and a per-country summary of your earnings across all stores in that country. 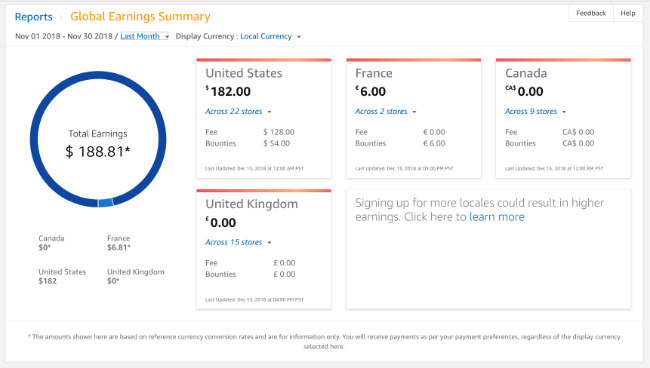 When you load this page for the first time, you will see the global earnings summary on the left of the screen in the default currency for the portal (for example, this will show in USD in the US portal), and each country’s summary on the right will show in the default currency for that country (for example, the UK earnings would show in GBP). If you prefer to view this information in a different currency, you can select your preferred display currency from the drop-down menu and all earnings information on the Global Reports will be refreshed in your selected currency. The next time you log in, we will remember your display preferences. 4. How Do I Look At A Specific Country’s Report On The Global Reports Page? You can click on any country’s ‘tile’ to view reports from that country, without ever needing to leave the portal you’re on. From the detailed country view, you can also click back to the Global Reports page.